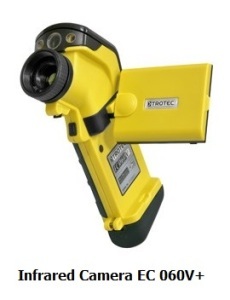 We are supplying all models of Thermal imaging cameras manufactured by Trotec, Germany. Thermal cameras are used for various functions. These include inspection of electrical installations, electrical machinery, building diagnostics, preventive maintenance, night vision security, constant monitoring of chemicals etc. Thermography is graphically analyzing temperature with respect to high and low temperature points. If temperature of a particular point is high in comparison to the surrounding, the spot will be shown in red colour. 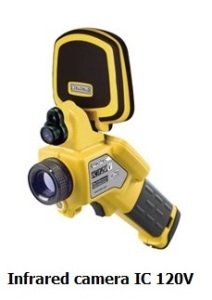 This principle is used in its advanced form in IR Thermal Imaging camera. Any electrical or mechanical equipment will develop an increase in temperature at a component before the component fails. 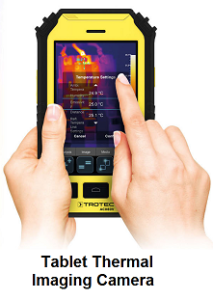 Thus periodical inspection using the principle of thermography without opening the equipment will give indications about a possible failure of the equipment. Building Maintenance : For analyzing insulation, cracks etc. Checking Photovoltaic Solar power plant : Defective cells can be detected. Leak detection : Leakages in water network can be found out. Electrical machinery : machines, control panels, transformers etc. Mechanical equipment: Heavy machinery, stationery machines etc. Tablet plus series is very handy camera with all functions of a professional IR camera combined with functionalities of a tablet / smartphone. The operating system is based on Android 4.0 integrated with thermal image analysis software. Capacitive touch screen functionality for easy recording. 8 Mega Pixel camera which gives great clarity. USB, WLAN, Bluetooth and GPS connectivity for data transfer. Wireless and Internet connectivity for data transfer. Recording function for IR videos in a single touch. Convenient dimension of 171x102x35 mm and weighing 405 gram. 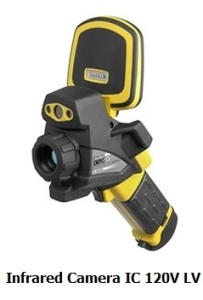 IC series is advanced handheld IR camera for thermographic measurement methods in an economic range. It utilizes microblometer technology. It has precise 50 Hz real time images made up of around 120,000 individual measurement spots.The device is supplied along with a sophisticated analysis software for downloading and analyzing he data. Minimum measurement is possible at -20 °C. Maximum possible measurement is +600°C. Accuracy of measurement is ±2°C. Detector resolution is 160 x 120 pixels. Thermal sensitivity of this thermal camera is 0.08 °C. High refresh rate of 50/60 Hz. Hinged 3.5 Inch LCD display for easy view. Keypad and Touch screen control for easy manoeuvre. Automatic temperature tracking of hot and cold spots. Voice recording for adding comments while recording. Integrated 5 Mega Pixel Digital camera is available in this thermal camera. Minimum measurement of this model is -20 °C. Maximum possible measurement is +1500°C. Accuracy of this thermal camera is ±2°C. Detector type is Focal Plane Array (FPA), uncooled microbolometer. Thermal sensitivity of this model is 0.08 °C. Colour display/resolution is 680 x 480 pixels. Storage medium is removable storage slot for miniSD card. Ingress protection is IP54 IEC 529 which is a good protection against water and dust. Shock resistance is 25G IEC 68-2-29. Minimum measurement of this thermal camera is -20 °C. Accuracy of this model is ±2°C. Detector resolution is 384 x 288 pixels. Thermal sensitivity of this thermal camera is 0.05 °C. Storage medium : Removable storage slot for miniSD card. Dimensions : 230 mm x 80 mm x 195 mm. 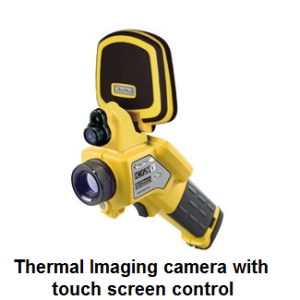 EC series of thermal camera has combined functions of advanced professional camera in economic range. This provides best value for money combination for all small to medium range of professional applications.There are two models available viz. 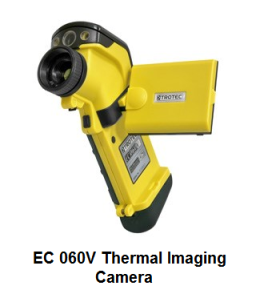 EC040 & EC060 V. EC060 V can combine the thermal image over a real image. Operating range is from -20 °C to +250°C. Image repetition frequency of this model is 50/60 Hz. Size of this IR camera is 175 x 55 x 160 mm, 150 gram. Data storage is done using a with SD card. This is powered through a rechargeable battery which will last upto 3.0 hours. Protection class of IP54 which is good protection against water and dust.. Interchangeable lens are available as optional purchase. Accuracy of readings is ±2°C. Image repetition frequency of the instrument is 50/60 Hz. Colour display/resolution is 680 x 480 pixels which gives clear pictures. Size of the model is 175 x 55 x 160 mm, 150 gram. Data storage is done on a SD card. It is powered through a rechargeable battery which will last upto 3.0 hours. Ingress Protection of IP54 as per IEC 529 classification. 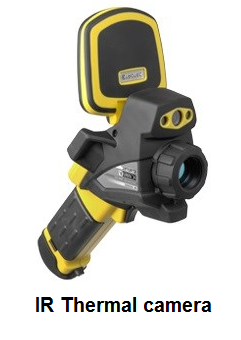 We also carry out Thermal Imaging (Theromgraphy) for machinery, buildings etc. Please see comparison of Thermal camera being supplied by us in Dubai, Abudhabi, UAE, Oman, Qatar, Kuwait & Saudi Arabia.